Anything I do on golf swing is widely popular with the general golfing public. Golfers just can’t get enough of anything to do with the swing. And mention the word “secret” and some golfers go weak at the knees. the simplest and easiest way of learning it. It’s really hard, isn’t it? You get bogged down. You think too much. And your golf game seems to go backwards and becomes way too hard. I’ve been there a million times and one reason why I’m so passionate about helping golfers play better golf without the clutter. Without the confusion. I like to make golf improvement no harder than riding a bike or driving a car. And this is what BioSwing Secrets is all about. I have simplified the golf swing so you don’t have to think about those 87 things when you swing. I have broken the swing down to the most important parts (it’s all part of my 80/20 thinking) so you can think less and play more. … when you stop thinking so much and trying so hard your learning system lights up. It starts to flow and the very small pieces of the golf swing puzzle start to fit together. Without any extra effort your natural golf swing becomes even better. It’s more accurate and you’re able to deliver the golf club to the back of the ball more consistently. Yep, you’ll find some extra power too so you’ll have bragging rights over your mates. But there’s something even better than longer drives and lower scores. Satisfaction and enjoyment. When you tap into your own golf swing, your secret golf swing, golf really does become more enjoyable. You’ll get a deep satisfaction when you play because you’re working with your system and not against. You’re doing the smallest amount of thinking to get the best result. 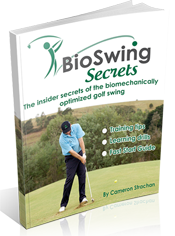 Instead of adding to an already complex and difficult game, BioSwing Secrets reduces the load. You get to focus on playing golf instead of thinking golf swing or swing tips. (quick fixes just don’t work. I know you know this but so much of the golf world still revolves around these instant type rubbish claims). A quick story: I was just chatting to a golf coach friend of mine. He was telling me some of the results he has been getting with BioSwing, particularly with the downswing ideas. We then had a discussion about the right arm and how it works on the downswing. He got all excited when I mentioned BioSwing Secrets has a dedicated video on the best way to use the right arm (left arm for us lefties). This drill is so simple and so powerful that the chances are you might not need any other swing drill again. Ever. I don’t call it the “Amazing Drill” for no reason. A few years ago I offered a variation of BioSwing Secrets and my Perfect Putting system together for half off. The promotion went crazy. To be fair, my website had all sorts of issues keeping up with the demand. Gotta say it’s a nice problem to have. – how to improve your golf swing without destroying your game in the process. – the swing drills that actually work and allow you to fix your golf swing. – the putting secrets of the worlds’ best putter. – how to make those pressure putts most of the time. – how to read greens correctly, even if you think you’re hopeless. – the amazing drill that really is the secret of the golf swing. – how to fast track your improvement so you can be swinging (and putting) better in the next few days. I could go on an on. But there is just too much content to list. The original offer sold @ $47. But today and for a limited time I’m selling these products together for only $37. But you better be quick because it’s just too good an offer to keep at this price. Last time I packaged these together was back in 2011 and it will probably be another few years before I do it again. So check out the offer here before it’s too late.